Raised $12,171— over $250 per taco! The Dallas, TX artist community was rocked when musicians Frankie Campagna and Adam Carter of Specter 45 lost their respective battles with depression and committed suicide within months of one another. Foundation 45 was founded shortly thereafter, with a mission to spread suicide awareness and prevention. Taco enthusiasts Jon Daniel, Jose Ralat, and Robert Strickland wanted to get involved with more than a simple donation, but weren’t interested in the traditional route of a walkathon or 5K. So they let their taco passions combine and created the (world's first?) 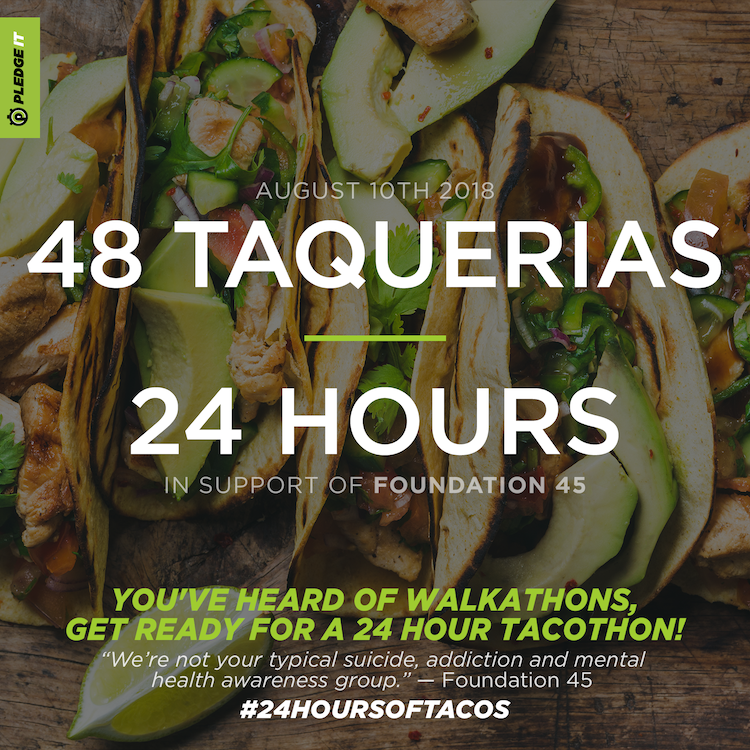 charitable Tacothon— 24 Hours of Tacos. Beginning at 6:30 AM these taco explorers took on the towering mission of eating at a different taqueria every 30 minutes for 24 hours to raise funds in support of Foundation 45. Foundation 45 recognizes that musicians, artists, and creative types are often at higher risk for issues with mental health and addiction. The foundation's founding tenet is to help surviving families and loved ones find meaning in these losses and to prevent future suicides altogether. Donations to Foundation 45 go directly to mental health support services for those at risk across the Dallas-Fort Worth area. In all, Daniel, Ralat, and Strickland raised over $12,000 to support this most vital cause— one taqueria at a time. Anyone wishing to give could make a pledge per taqueria visited during the event, or make a flat one-time donation to benefit Foundation 45. To gain pledges, Daniel, Ralat, and Strickland reached out to their friends and community. The trio also cultivated a healthy social media following surrounding the event, which included the opportunity to win a tour with the crew to a handful of their favorite taco spots. All in all, the efforts were well-rewarded. Forty-eight taqeurias visited and dozens of tacos eaten earned $12,171 in contributions toward Foundation 45’s most vital mission: Promoting suicide prevention and awareness. The team at Pledge It is grateful that these three taco connoisseurs selected its platform to digitally power 24 Hours of Tacos. But it was the Dallas community of artists that made the campaign so successful. Now the gang is back for 2019, and we're eager to help make Year 2 an even bigger success.